‘Stop feeding the Caucasus’ is a cry frequently heard from Russian nationalists, of both the radical and moderate-democratic persuasions. Aleksey Navalny is the most typical example. The suggestion is that Chechnya and the other republics of the northern Caucasus receive too much in the way of subsidies, both direct and indirect, and that there is no check on how the money is spent. 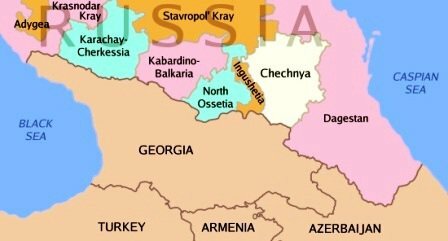 As a result, people in other parts of Russia are convinced that the Caucasus is drowning in cash. But is this true? 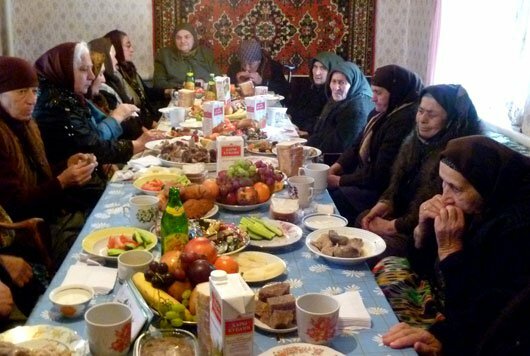 How rich are the inhabitants of the northern Caucasus, and what do they eat on a day to day basis? Let’s take as an example a village in the Karachay-Cherkessiya Republic, in the west of the region. If five hundred people gather on the street in a Russian town or village, it won’t be long before a police patrol car or an anti-riot squad appears. 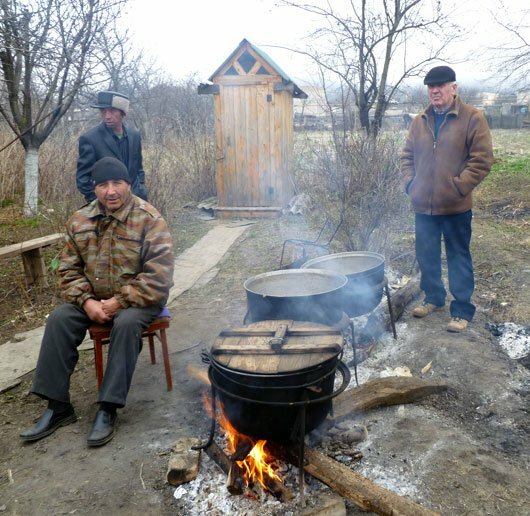 In a Caucasus mountain village a crowd like this arouses not the slightest interest, let alone alarm, in the local guardians of law and order. They realise that this is no demo, but a routine wedding or funeral. Click map to enlarge (opens in new window). Today it is the latter that has drawn a crowd to the village of Sary-Tyuz. Family and neighbours have gathered to say their goodbyes to Mariam Khubieva, an elderly widow. Her life has mirrored all the major events the people of the Karachayevo region have lived through in the twentieth century. In 1943 Mariam was a teenage girl working on a collective farm. She survived the five-month German occupation of the area, and was deported to Kazakhstan along with the entire Karachai population, officially accused of collaboration with the Nazis. The true reason for this exile is still unknown: Karachais tend to blame the Georgians, who, they claim, denounced them in order to annexe the mountain regions adjoining their republic. Mariam lived in exile until the ‘50s, when she returned home together with most surviving Karachais. Their old wooden houses had been burned down, and they hastily built new ones out of home-made mud bricks. They dug holes in the middle of the unpaved street, threw in some straw, added water and produced their own building material. Mariam married and worked in a small clothing factory in the village. In the ‘90s the factory closed down after Karachayevo Cherkessiya, like the whole northern Caucasus, was flooded with cheap Turkish knitwear. Mariam’s husband, a tractor driver at the collective farm, died at around this time. Even after Putin’s pre-election pension increases in 2011, Mariam’s basic state pension was no more than 5,000 roubles a month – about $150. However, in the Caucasus pension levels have always been higher than average. In the first place, half the peoples of the Caucasus – Karachais, Balkars, Chechens and Ingushes – receive compensation for their deportation. In the second, by the 1950s almost all the inhabitants of Karachayevo Cherkessiya were registered as disabled. This was a result not only of their working conditions, which were indeed hard, but of the loyalty of local health service officials, something unknown in any other part of Russia. The loyalty, it must be said, comes at a price of about six month’s pension in the form of a bribe. So, taking into account her compensation and invalidity benefits, the deceased was in receipt of a total of about $260 from the federal exchequer each month. Mariam was buried according to Muslim rites, without an autopsy and before sunset on the day of her death. In other regions of Russia official notification of a death reaches the social security agencies pretty quickly, but in the Caucasus Mariam Khubieva will go on receiving her pension and other benefits for quite some time. It is accepted practice that her relatives will get the payments for another two to three years. During that time the deceased will also continue to ‘vote’ in elections. The average wage in Karachayevo Cherkessiya is not much higher than a pension. None of Mariam Khubieva’s adult children, her closest relatives, are well off, but if you were to tell an average wage-earner in central Russia about the amount spent on funerals here, they would think the wake was sponsored by an oligarch. Although Maulud – readings of sacred texts about the life of the Prophet – is first and foremost a religious ceremony, it is dominated by food. ‘Doing Maulud’ means not just inviting the mullahs for the readings, but feeding about 500 relatives and neighbours. The memorial rites involve the ritual slaughter of three bulls. The first should be slaughtered on the third day after the funeral. Then the mullahs calculate the date of the 52nd day after death, and a second bull is killed on that day. The third bull is slaughtered on the first anniversary of the death. The bulls have to be large and well-fed; otherwise they will not provide enough meat for everyone. Almost all the dishes prepared for Maulud are meat based. They include khychiny (fried pasties), pelmeny (large ravioli) and simple boiled meat. The guests don’t just eat together, but take food home afterwards in large plastic bags. These ‘goodie bags’ always include bread, a pack of pasta, a bottle of cooking oil, a packet of sugar and a hunk of bull meat. The remaining contents depend on the imagination and financial situation of the organisers. There might be dried fruit, imported cheese, chocolate, tea or coffee. The guests take these bags home with them, and if someone didn’t make it to the celebration, someone will bring them a bag. The tables at the ceremony would remind you of a wedding reception, were it not for the lack of alcohol. I was told that there is a saying in work teams where there are people of different ethnic backgrounds: ‘to drink like a Karachai’, in other words, only on happy occasions. Sary-Tyuz is not the most typical of Karachayevo-Cherkessiyan villages. It was built at the beginning of the 20th century, to a regular ground plan. It has a population of around 4,000. It still has small mud brick and wooden houses, both pre- and post-war, but there are many more modern brick houses, some of them worth more than four neighbouring houses put together; these palaces belong to those known locally as ‘the mafia’. Even the poorest of houses are painted on the outside, and their yards swept clean. At the same time, cattle wander the filthy, potholed streets – chased out of their cowsheds to keep those clear of muck. Sometimes cows calve right on the street; when this happens villagers contact the owner on their mobile phone, and they drive in, stick the calf in the boot and take it home. Local custom dictates that people don’t just go for a walk in the village. If there is a crowd on the street in front of someone’s house it is always a sign of some event happening, such as today’s Maulud. The Maulud has been organised by the dead woman’s brother, Aslanbek. He is the manager of the local office of the company that supplies the region with gas fittings. Most of the villages in Karachayevo-Cherkessiya have a gas supply. In fact the houses in Sary-Tyuz also have running water, a level of comfort unknown in most Russian villages. Although Aslanbek is a manager, with two people working under him and a company car, his salary is less than $300 a month. Like most rural households, his family are also smallholders, with a 1,200 sq.m (0.3 acre) potato field and various breeds of cattle. In his byre he has four milking cows, two calves and two young bullocks. They are reared for sale, or in case they are needed for a wedding or funeral. Aslanbek is also the owner of twenty sheep. Aslanbek’s herd is not particularly large in Karachayevo terms. Even someone with ten cows and fifty sheep is not considered a wealthy man. A wealthy man is someone who owns his own company (although they are few and far between) or who has a direct connection with public finance. Their smallholdings, however, mean that villagers are self-sufficient in food and may even have a surplus to sell. They go shopping to buy salt, sugar, tea, flour and cooking oil, but they produce all their own vegetables, dairy produce and meat. Aslanbek’s cousin Hussei is an example of a rich cattle farmer. Apart from owning a large herd, he has two tractors, bought from the collective farm when it folded, parked in his farmyard, and a thoroughbred trotter for cachet. Hussei is a real custodian of Karachaevo traditions. Back in Soviet times he abducted his wife and would not allow her relatives to free her until after the proper marriage ceremony. The bride did, however, consent to being abducted. Hussei’s son and right hand man has also been brought up to observe tradition. If there were no artificial obstacles to business in Russia, the organic meat from Hussei’s bullocks would be in great demand. In reality, there is no point in taking cattle north of Krasnodar; police extortion on the roads makes it not worth the bother. Aslanbek and his son Murat have been less fortunate. Murat’s life story could already provide the material for a melodramatic TV serial. He got married straight after school, walked out on his wife and child, married again and then left his second wife for a third. He is still friendly with all three women. Like all Karachai who have grown up in a village, Murat can turn his hand to any agricultural work, but he has no taste for spending his life tending cows and potatoes. At 22, he has had even more jobs than wives. At the moment, as his mother says, ‘my son is a banker’. He services two ATMs and is driver to a bank owner. His monthly salary is about $50 higher than that of his father, but the main thing is that every now and then he drives up to the house in a Lexus. The owner of the bank himself has had an untypical life for someone from Karachayevo Cherkessiya. His father left his family and succumbed to the bottle – alcoholism is rare but not unknown among Karachais. His son grew up without a father and made a lot of money, but in the 2000s he sold his business and became the regional representative of a major bank. He forgave his father and if the latter goes on a bender, he takes him to the republic’s central hospital, where he rents a ward specially for these occasions. He keeps this a secret from his mother, who has never forgiven her husband for abandoning her. Mariam Khubieva’s niece Fatima looks like a rich fairy godmother at the funeral. In 2003, after university, she went to live in St Petersburg. Many Karachai women live in the big cities, where they sell clothes or pasties in street markets. Fatima is the exception. She immediately got a job selling French lingerie to a chain of retail stores. She was quickly promoted to senior sales assistant, then head of department and then brand manager, and her career advancement looks likely to continue. Fatima’s monthly salary is $1,500. People in the Caucasus feed themselves, and if Russia does spend money on the the region, it goes no further than the top bureaucrats’ pockets. Her sister Gulnara, like her other relatives, sees Fatima only once or twice a year, at weddings and sad occasions such as today’s. She lives in the village of Teberda, and works at a market in Dombai, the republic’s most popular ski resort. Dombai’s pistes attract local ski junkies, Russians who don’t have passports for travelling abroad and people trying to save money. This third group is doomed to disappointment. In the first place, the republic’s embryonic service industry may be relatively cheap in most places, but in Dombai café and restaurant prices equal those of the elite ski resorts of France and Switzerland. A khychin meat pasty, for example, will set you back $15-17. Sometimes customers are openly swindled. Gulnara defied the sadness of the occasion to laugh about a neighbour who sold a gullible Muscovite tourist a dyed sheepskin, claiming it belonged to a wolf. Gulnara suggests her sister Fatima move to Teberda and find herself a Karachai husband. But Fatima prefers to live in St Petersburg and sell lacy underwear rather than dyed sheepskins. Maulud reminds me of a party: older men sit around the fires, stirring the meat in the cauldrons and putting the world to rights. They sigh about old Soviet times, when there were collective farms, the police didn’t take bribes and young people didn’t leave to find work in the towns. They have never heard of the Moscow nationalists’ famous slogan. If they had, they would have replied that they feed themselves, and that if Russia does spend money on the Caucasus, it goes no further than the top bureaucrats’ pockets. The rest of the population are at best fed a few crumbs in the form of invalidity benefits.